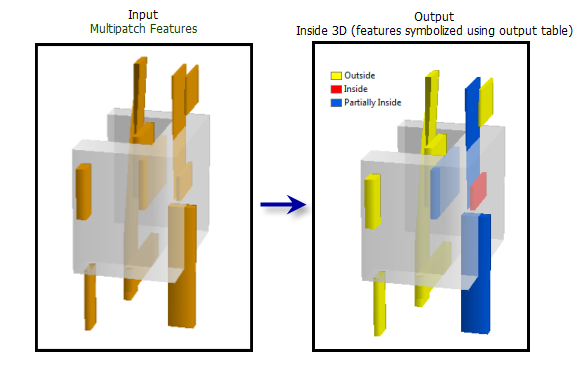 Determines if 3D features from an input feature class are contained inside a closed multipatch, and writes an output table recording the features that are partially or fully inside the multipatch. All input features must have Z information stored as part of their geometry. If field based height measurements are present in a 2D feature class, the Feature To 3D By Attribute tool can be used to create a 3D feature class. Closed multipatch geometry is required for this analysis. The Is Closed 3D tool can be used to determine if a multipatch feature class contains closed features, and the Enclose Multipatch tool can be used to eliminate gaps in multipatch features. If the Complex Output Table option is selected, a record is created for each multipatch that a given input feature intersects. A feature may fall within multiple closed multipatch features and have multiple entries in the output table. Target_ID—The unique ID of the input feature. Status—Indicates if the feature identified by the Target_ID field is inside or partially inside a multipatch. The input multipatch or 3D point, line, or polygon feature class. The closed multipatch features that will be used as the containers for the input features. The output table providing a list of 3D Input Features that are inside or partially inside the Input Multipatch Features which are closed. The output table contains an OBJECTID (object ID), Target_ID, and Status field. The Status field will state if the input feature (Target_ID) is inside or partially inside a multipatch. Specifies if the output table will identify the relationship between the Input Features and the Input Multipatch Features through the creation of a Contain_ID field that identifies the multipatch feature that contains the input feature. Checked—The multipatch feature that contains an input feature will be identified. Unchecked—The multipatch feature that contains an input feature will not be identified. This is the default. COMPLEX —The multipatch feature that contains an input feature will be identified. SIMPLE —The multipatch feature that contains an input feature will not be identified. This is the default.